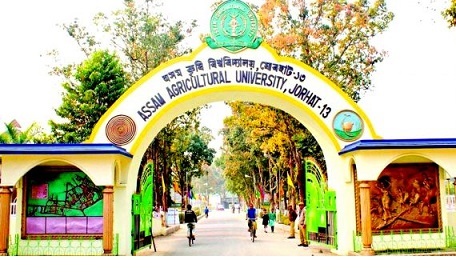 Now, the Assam Agricultural University (AAU) has come into direct confrontation with the ruling Bharatiya Janata Party (BJP) over the issue of destruction of Veterinary Science College playground at Khanapara in Guwahati. After Assam BJP president Ranjeet Kumar Dass, who remarked that the AAU authority had ‘no knowledge of democracy’ on June 14, 2018, now State BJP treasurer Rajkumar Sharma has alleged that the AAU authority had given false information regarding the playground in its RTI reply. In reply to an RTI, the AAU authority stated that the BJP had filled the cricket pitch in the playground with earth for the meeting of Prime Minister Narendra Modi held in May, 2017. The AAU authority also claimed that before the 2014 Lok Sabha election, in order to organize a public meeting of Narendra Modi in February, 2014, the circle officer of Dispur revenue circle had ordered to break the wall of the sports project. “But though a part of the wall of the playground complex was broken to make arrangement for the entry of Narendra Modi in February, 2014, we have reconstructed that wall,” claimed State BJP treasurer Sharma. Sharma also rejected the claim of the Associate Director of Students’ Welfare in his RTI reply that concrete blocks were placed in the playground to make a helipad without permission. Claiming that the BJP did not make any helipad using block bricks, Sharma asserted that the party has already borne the cost for landing or keeping helicopter in the playground. Sharma also claimed that the BJP had organized the first meeting at Khanapara playground during Narendra Modi’s visit to Assam on February 8, 2014. After that BJP has organized only four meetings in the playground so far. Meanwhile, on June 14, 2018, Assam BJP president Dass slammed the AAU authority stating that it had ‘no knowledge of democracy’. On the other hand, there has been confusion in the AAU authorities over the RTI reply regarding the playground. AAU Vice Chancellor KM Bujarbaruah stating that he came to know about the RTI reply only through Northeast Now, he had told Northeast Now that the Associate Director of Students’ Welfare was not authorised to reply to the RTI application. After a series of detailed reports published in Northeast Now regarding the issue of the destruction of such a huge playground equipped with modern facilities for activities having no connection with sports, a section of Ranji players, sports organizers, All Assam Students’ Union (AASU), Asom Jatiyatabadi Yuva Chatra Parishad (AJYCP), Krishak Mukti Sangram Samiti (KMSS) and the Congress have already expressed their concern. After opposite statements of the AAU and the BJP regarding the destruction of the playground, now question arises, who is telling lie? Who is right?